To Cite: Manaen Rai Y, Ling K, Qi W. Genotypes and Susceptibility of Candida Species Causing Acute and Recurrent Vulvovaginitis, Jundishapur J Microbiol. 2017 ; 10(11):e12861. doi: 10.5812/jjm.12861. Background: Candida albicans genotypes derived from PCR-based techniques targeting 25S rDNA have been shown to correlate with antifungal susceptibility and virulence factors. However, this method has not been used in isolates recovered from recurrent vulvovaginal candidiasis. Comparing intron-based genotypes with the drug susceptibility of isolates recovered from recurrent vulvovaginitis may aid in epidemiological studies and better patient management. Objectives: The purpose of this study was to investigate the genetic diversity of isolates involved in vulvovaginal candidiasis and their susceptibility to seven antifungal agents. Methods: Candida genotyping based on the presence or absence of a group I intron by PCR targeting 25S rDNA and drug susceptibility assays using a modified Alamar Blue broth microdilution method were carried out. Fisher’s exact test and the Mann-Whitney U test were performed, and P < 0.05 was considered statistically significant. Results: Candida albicans was the predominant species among 384 Candida isolates followed by C. glabrata in acute and C. tropicalis in recurrent vulvovaginitis. Candida albicans from acute infections were more susceptible to fluconazole than isolates from recurrent cases but more resistant to miconazole and amphotericin B. The dominant genotype A was resistant to itraconazole and demonstrated higher minimal inhibitory concentrations (MICs) to 5-fluorocytosine and itraconazole. All C. albicans and non-albicans species. with the group I intron were susceptible to 5-fluorocytosine. Conclusions: Candida albicans is the predominant cause of acute and recurrent vulvovaginal candidiasis, and drug susceptibility differed significantly among type of infection. Strain differences based on the group I intron may not be clinically significant in disease recurrence. However, the presence or absence of the group I intron has significant impact on antifungal MICs and resistance. Moreover, the group I intron in C. albicans and non-albicans may be the most important factor related to 5-fluorocytosine susceptibility. Candida albicans has been recognized as the main pathogen in both acute vulvovaginal candidiasis (AVVC) and recurrent vulvovaginal candidiasis (RVVC) (1-3). About 75% of women will experience AVVC in their lifetimes. Although a small percentage of women (< 5%) will develop RVVC, whose pathogenesis is poorly understood, it requires an aggressive treatment plan and often imposes long-term burdens on mental, physical, financial, and sexual health (4). Because of the high prevalence of C. albicans and the long-term burden due to disease recurrence, it is essential to understand its epidemiology and pathogenesis at the genetic level. PCR-based techniques targeting 25S rDNA have grouped C. albicans into three genotypes based on the presence of a group I intron in 25S rDNA (genotype B, 840 bp), the absence of the intron (genotype A, 450 bp), and gene containing both the presence and absence of this intron (genotype C) (5). Candida dubliniensis also possesses an intron at the same location and gives a 1080 bp product (genotype D) and a 1400 bp product (genotype E) (5, 6). These genotypes have been reported to correlate with antifungal susceptibility (7-9) and virulence factors like cell adherence, phospholipase activity, and invasiveness (2, 10, 11). Genotyping based on group I introns has been used several times for studying the genetic variation of isolates involved in vulvovaginal candidiasis, cutaneous candidiasis, and oral candidiasis. However, this method has not been used for isolates recovered from RVVC. Comparing intron-based susceptibility of isolates recovered from RVVC may clarify the epidemiology of the disease and lead to better patient management. We investigated the genetic diversity of C. albicans isolates involved in AVVC and RVVC and their susceptibility to seven antifungal agents: nystatin, fluconazole, 5-fluorocytosine, miconazole, itraconazole, clotrimazole, and amphotericin B. This study was approved by the Kunming medical university ethics committee and informed verbal consent was obtained from the patients to use the collected Candida isolates for this study. A total of 384 isolates obtained from culture-positive cases of AVVC i.e., episode of symptomatic vulvovaginitis less than four times a year and RVVC with a history of at least four symptomatic VVC episodes within 1 year were included in this study. All isolates were cultured on agar slants and stored at room temperature, molecularly characterized by intron-based PCR targeting 25S rDNA, and assayed for their susceptibility to seven antifungal agents using the clinical and laboratory standards institute (CLSI) M27-A3 microbroth dilution method modified with the alamarBlue reagent (Bio-Rad AbDSerotec, UK). Nystatin and clotrimazole were provided by The laboratory labor Dr. Ehrenstorfer-Schäfers (Germany). Fluconazole, itraconazole, amphotericin B, and miconazole were provided by Sigma-Aldrich (US) and 5-fluorocytosine by European Pharmacopoeia (UK). All isolates were subcultured on SDA slants (bioMerieux, France) to ensure viability and purity, and were identified by colony color on a CHROMagar Candida plate (Zheng Zhou Biocell Biotechnology, China). In addition, the VITEK®2 compact system (bioMerieux, France) was used for confirmation of Candida species. DNA extraction was carried out using a nucleic acid purification kit (AxyPrep Blood Genomic DNA miniprep kit, U.S.) following the manufacturer’s protocol. Primer pairs CA-INT-F (5’-ATAAGGGAAGTCGGCAAAATAGATCCGTAA-3’) and CA-INT-R (5’-CCTTGGCTGTGGTTTCGCTAGATAGTAGAT-3’) (Genbank, China) were used for genotype analysis on the basis of 25S rDNA as described in previous studies (5, 8). Susceptibility tests were performed based on CLSI document M27-A3 modified with the alamar Blue reagent for colorimetric minimal inhibitory concentration (MIC) determination (12, 13). The cell mass was diluted in 5 mL of sterile 0.9% saline solution to prepare an initial inoculum. Turbidity was equivalent to McFarland Standard no. 0.5. Twenty microliters of fungal inoculum of 0.5 - 2.5 × 103 CFU/mL in 140 μL RPMI 1640 medium (Gibco, US) were added to wells of a 96-well microdilution plate (Zhejiang Huangyan Wuzhou Medical Plastics Factory, China) with column 1 serving as a negative control and column 2 with fungal inoculum alone serving as a positive control. Antifungal agents were added in series of two-fold dilutions to columns 3 - 12. Dilution ranges for fluconazole were 0.125 - 64 μg/mL and for clotrimazole 0.06 - 32 μg/mL. For all other antifungal agents, dilution ranges were 0.0313 - 16 μg/mL. For MIC determination, 20 μL of freshly prepared colorimetric reagent was added to each well, and then the plates were incubated at 35°C for 24 hour before determining the MIC of each well. Yeast growth was evident as a change in the growth indicator from blue (negative) to red (positive). Colorimetric MICs were interpreted as the lowest concentration of antifungal solution that caused a change from red (growth) to blue (no growth). Candida albicans ATCC 90028 was tested to ensure quality control. The fluconazole breakpoints for C. albicans and C. tropicalis (Susceptible (S) ≤ 2 mg/L, Intermediate category (I) = 4 mg/L, Resistant (R) ≥ 8 mg/L), and for C. glabrata (I ≤ 32 mg/L, R ≥ 64 mg/L) were those published by the CLSI (2012), and all C. krusei isolates were considered resistant to fluconazole (14). The itraconazole breakpoints for C. albicans (S ≤ 0.125 mg/L, I = 0.25 - 0.5 mg/L, R ≥ 1 mg/L), C. glabrata (S ≤ 2 mg/L, R > 2 mg/L), C. tropicalis (S ≤ 0.5 mg/L, R > 0.5 mg/L), and C. krusei (S ≤ 1 mg/L, R > 1 mg/L) were referenced from a similar study (15). As for miconazole, breakpoints used were S ≤ 1 mg/L and R ≥ 8 mg/L (16, 17). Adopted breakpoints for 5-fluorocytosine were S ≤ 4 mg/L, I = 8 - 16 mg/L, and R ≥ 32 mg/L, and for amphotericin B S ≤ 1 mg/L and R ≥ 2 mg/L (18). The brea kpoints for nystatin (S ≤ 1 mg/L, R > 1 mg/L) and clotrimazole (S ≤ 0.25 mg/L, I = 0.5 mg/L, R ≥ 1 mg/L) were from similar studies (19, 20). SPSS version 17.0 (SPSS Inc., U.S.) was used for statistical analysis. Fisher’s exact test and the Mann-Whitney U test were performed, and P < 0.05 was considered statistically significant. Candida albicans (335/384) was the most common species isolated followed by C. glabrata (22/384), C. tropicalis (15/384), and C. krusei (12/384). C. albicans was predominant in both VVC (196/229) and RVVC (139/155), followed by C. glabrata (17/229) in VVC and C. tropicalis (6/155) in RVVC. Out of 335 C. albicans, 309, 19, and 7 isolates were identified as genotype A (450 bp), B (840 bp), and C (450 bp and 840 bp), respectively (Figure 1). Genotype A was predominant in both VVC (176/196) and RVVC (133/ 139). No significant difference was identified between the genotype distribution and the type of VVC (P = 0.06). None of the PCR products in this study were 1040 bp or 1080 bp long that correspond to C. dubliniensis. Among non-albicans species, 3 out of 49 produced 840 bp long products. Of these, 2 were C. tropicalis and 1 was C. glabrata. All other non-albicans produced 450 bp long products. Figure 1. 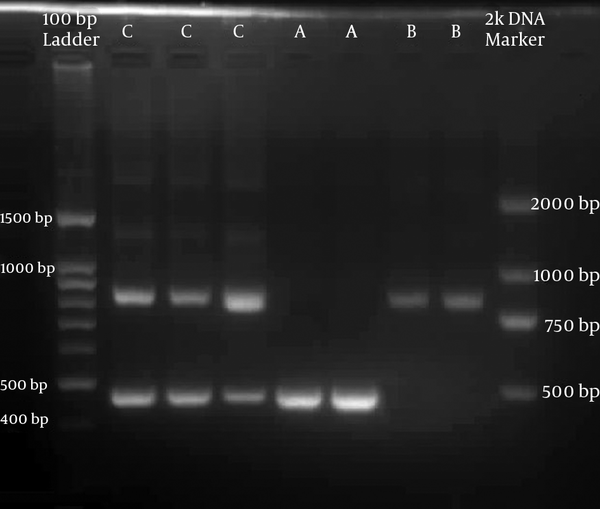 Agarose gel (3%) stained with ethidium bromide showing DNA band pattern profiles of C. albicans genotypes A (450 bp), B (840 bp), and C (450 bp and 840 bp) as labeled in the figure, with a 100 bp ladder (Trans Gen Biotech, U.S.) and 2k DNA marker (Trans Gen Biotech, U.S.). Candida albicans in the VVC group was found to be more susceptible to fluconazole than in the RVVC group (P = 0.04), while there was lower susceptibility to miconazole (P = 0.001) and amphotericin B (P = 0.007) than in the RVVC group (Table 1). Abbreviations: I, intermediate category; R, resistant; S, susceptible. Genotype A (54%) was more resistant than genotypes B and C (26.9%) for itraconazole (P = 0.003). Other than this, no significant differences were identified. Notably, none of the genotypes were resistant to 5-fluorocytosine (Table 2). The MICs of genotypes B and C for 5-fluorocytosine (P = 0.008) and itraconazole (P = 0.003) were significantly lower than that of genotype A (Table 3). The lowest MICs observed for genotype A were for clotrimazole and amphotericin B (MIC90 = 1 mg/L), while for the other two genotypes they were for 5-fluorocytosine (MIC90 = 0.475 mg/L). The highest MICs observed were for nystatin, miconazole, and itraconazole for genotype A (MIC90 = 16 mg/L), while for genotypes B and C they were for nystatin (MIC90 = 10.4 mg/L). We found C. albicans as the major pathogen isolated from both types of VVC as previously reported (1-3). Of the non-albicans species isolated from AVVC patients, C. glabrata was predominant. The preponderance of C. glabrata among non-albicans in both VVC types has been previously recognized (1, 2, 21). However, in patients with RVVC, we found a higher prevalence of C. tropicalis in this study. Genotyping results showed that genotype A was the most common followed by genotype B then genotype C. This ranking agrees well with several other studies (6, 7), but differs from one study in which a higher incidence of genotype C was found (9). None of the PCR products corresponded to C. dubliniensis, and to our knowledge no C. dubliniensis has been reported in our district, but further research is required to confirm its absence. Investigators have reported the association of genotypes with virulence factors and invasiveness (2, 10, 11), but genotypes and VVC types did not show any relation in the present study. This shows the complexity of disease recurrence and suggests that strain differences based on group I introns in RVVC may not have clinical significance. For AVVC and RVVC, susceptibility results were consistent with one study in China (22). but not with other studies (1, 18). These inconsistent findings may be due to the different geographical regions, differences in choice of initial agents leading to different stress responses, and the tolerance of Candida species towards antifungal agents. Moreover, C. albicans isolated from RVVC demonstrated significant resistance against the most commonly prescribed drug, fluconazole, and greater prior exposure could be the reason. However, the results were different than expected for miconazole and amphotericin B, which showed that C. albicans isolates from the RVVC group were more susceptible compared to those from AVVC; this is possibly due to the use of over-the-counter agents. We also found that intron-based genotypes have a significant impact on drug MICs and susceptibility. In agreement with one study, the MICs of the intronless genotype A were significantly higher than those of the other two genotypes for 5-fluorocytosine and itraconazole (7). We also found genotype A to be significantly resistant against itraconazole, which is in agreement with two other studies in which genotype A exhibited more resistance than the other two genotypes (6, 8, 9). In contrast, other studies have found no association between antifungal resistance and genotype (7, 23). Differences in genotype susceptibility may be due to the differences in geographical location and other factors involved in resistance besides the group I intron. On the other hand, we observed that all C. albicans of genotype B and non-albicans with 840 bp products, which defines the presence of the group I intron, were susceptible to 5-fluorocytosine. Multiple factors are certainly responsible for resistance, and the presence of the group I intron is only one factor, but it appears to be the most important one contributing to 5-fluorocytosine susceptibility. In conclusion, the most commonly isolated yeast responsible for AVVC and RVVC was C. albicans. Significant differences in C. albicans susceptibility among AVVC and RVVC were observed for nystatin, miconazole, and amphotericin B. However, no remarkable differences were identified for the susceptibility of non-albicans species among VVC types. The presence or absence of the group I intron had a significant impact on MICs. The dominant intron less genotype A was resistant to itraconazole, and the presence of the group I intron in C. albicans and non-albicans appears to play an important role in 5-fluorocytosine susceptibility. However, strain differences based on the group I intron in cases of AVVC and RVVC may not have clinical significance. We thank the department of medical genetics of the institute of medical biology, Chinese academy of medical sciences and Peking Union medical college for technical assistance regarding genotype analysis. Authors’ Contribution: Study concept and design: Wenjin Qi; acquisition of data: Yashaswi Manaen Rai and Kaijian Ling; analysis and interpretation of data: Yashaswi Manaen Rai and Kaijian Ling; drafting of the manuscript: Yashaswi Manaen Rai and Wenjin Qi; critical revision of the manuscript for important intellectual content: Wenjin Qi; statistical analysis: Yashaswi Manaen Rai; administrative, technical, and material support: Wenjin Qi; study supervision: Wenjin Qi. Financial Disclosure: We declare that we have no financial interests related to the material in the manuscript. Funding/Support: This work was financially supported by the national natural science foundation of China (project 81660248) and the fostering talents project for young academic and technology leaders in Yunnan province (project 2012HB29). Role of the Sponsor: The funding body had no role in the study design and collection, analysis, and interpretation of data, or in writing the manuscript.